Shane Larkin scored eight of his career-high 28 points in the final 2 1/2 minutes to help No. 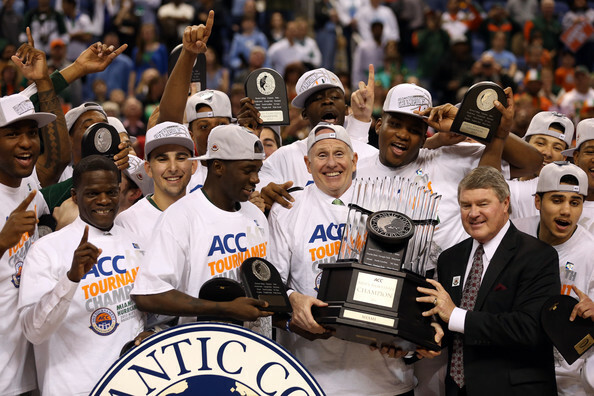 9 Miami pull away and beat North Carolina 87-77 in Sunday's ACC tournament final. Trey McKinney Jones added a career-high 20 points for the top-seeded Hurricanes (27-6), including the go-ahead three-pointer with 6:27 left that started Miami's final push toward its first tournament title. It came one week after the Canes completed its surprising run to its first ACC regular-season title in program history. And just as Larkin had promised, the Hurricanes weren't satisfied. "We want more," senior Julian Gamble said. "After we clinched the outright regular-season title at home and we (cut down the nets), we were like, `Wasn't that the funnest thing you've ever done?' We wanted to go to Greensboro and do it again." Larkin was chosen the tournament's MVP after finishing as runner-up for league player of the year. But he was at his best when the Hurricanes needed him to complete their climb from being picked fifth in the preseason poll to ACC champion. In a terrific back-and-forth game filled with big shots, the Hurricanes finally slowed P.J. Hairston and the third-seeded Tar Heels (24-10) enough down the stretch to secure what amounted to a road win in front of UNC's home-state crowd.